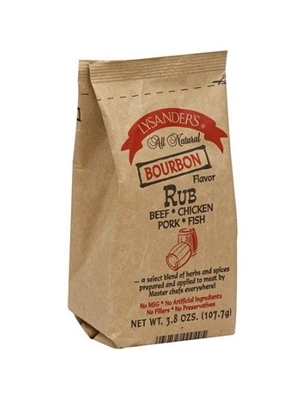 There is no easier way to turn a plain piece of meat into an extraordinary meal than with LYSANDER'S Bourbon Rub. Simply rub on and cook. LYSANDER'S Bourbon Rub is made with a proprietary blend of all-natural herbs and spices developed to complement the natural meat flavors, not overpower them. Salt, sugar, spices, dehydrated lemon peel, natural flavors, citric acid, teriyaki sauce (soy sauce [wheat, soybeans, salt], wine, vinegar, salt, onion powder, spice extractives, succinic acid, garlic powder, maltodextrin, and salt), dehydrated onion and garlic, pineapple solids.